I have the new one with the hammer safety in 38 w.c.f. and it functions just fine. I do miss the 4 clicks. Thank you DeputyDuke for your reply , I saw this thread and do not mean to hijack it , but like the original poster I had some questions and always looking for the voice of experience and input from those who have actually owned and used the uberti . No problems with mine fit n’ finish wise. Great pistols. The “charcoal blue” or whatever they are calling it now is beautiful, but doesn’t hold up well. As far as installing the Wolff hammer apring to lighten the hammer, try this old timer’s trick first. Just put a leather pad between the spring and frame and tighten the screw as usual. May not need that new spring. I've got a Beretta (Uberti) Stampede with a 7 1/2" BBL that is my all time favorite pistol. It shoots point of aim, balances like a Colt, and is pleasant to shoot. I also have a Uberti 1875 Schofield in a .38 Spl. with the longer 7 1/2" BBL. Given the Schofield's extra weight (mostly forward), it is an inexpensive pleasure to shoot! 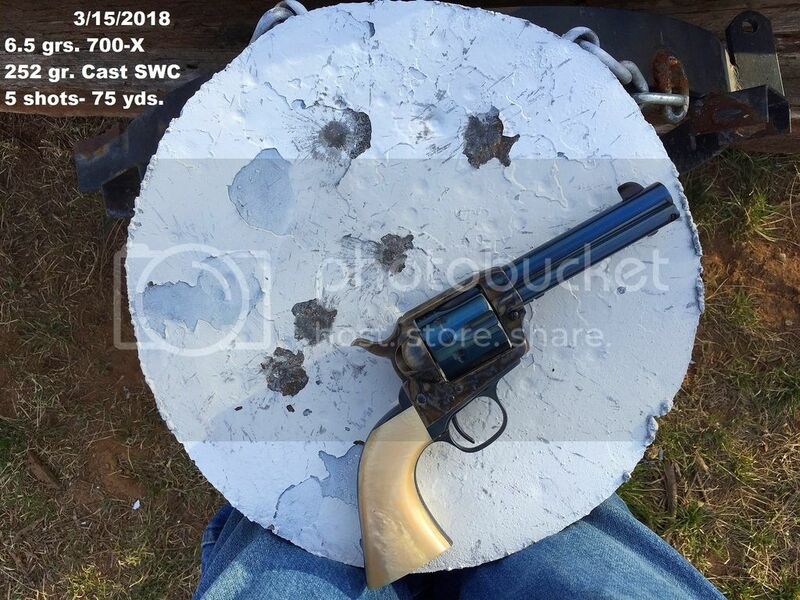 I had a Bisley .357 Uberti with the shorter barrel; however, I never warmed up to its grip and extra blast (it was accurate and pretty to look at), so I sent it down the road. The last Uberti I traded off was a .22LR model with a 6 1/2" BBL. All my Uberti's have been reliable, fine shooters; however, there were complaints about some of the earlier 1873 (mostly .45 Colt) models that had cylinders that were not "bored" correctly (heck, I've had that problem with Rugers). I think Uberti has pretty well cured any QA problems they may have had in the past and have paid attention to "Cowboy shooting" crowd who demand quality and reliability. Obviously, I'm a fan! One is a Uberti. One is a 1st gen Colt. Both shoot well and have 4 clicks when cocking them. what was the customary barrel length in the colts that were carried around 1873? I have lots of Uberti's and have had lots of Colts. Except for my old 1st Generation Colts, I'll take the Uberti all day. I've loaded 44-40 and 45 Colt and the latter seems far less picky about loads. My most recent is a Frisco and it is very accurate. For a load to duplicate the original I use 6.5 gr. of either Red Dot or 700-X and bullet's cast from a Lyman 454190 mold. To answer your other questions, the front sight can easily be worked down to regulate the load and 7 1/2" was the original barrel length. 35-thats some good shooting with that good looking shooting iron! I picked up a 44 spc with 4 5/8 barrel the little 44 out shoots both my rugers surprised me,. It has been added to the keeper list. The SAA was adopted in 1873 with a 7-1/2" barrel. The Artillery model was 5-1/2". These lengths and many others were offered to civilians. As far as I know. Despite what my kids think- I wasn't there. does the smokewagon have the competition sights? I have 5 Uberti's...love them. I have Rugers, too and I like them...but love the Uberti's. The Ruger single action is really a different gun...stronger...but you lose the essence of the single action, in my opinion. I have a Bisley...it is sweet, too. Oh man, I've been bouncing around about getting an Uberti - no single action in 45 Colt right now. I've heard good things about the Uberti's, especially the Taylor tuned ones. All these great pix made my mind up. Off to the LGS this weekend. I think you'll be quite happy with it. I'm still sorting out what I'm seeing posted about the change in the action (built-in safety, etc.) and I'm sure glad that my Taylor Tuned 45 Smoke Wagon and Navy Arms tuned 32-20 are of the older type, true to the Colt action design. If buying another gun now, I would seek to find the same action for any new acquisition. Good luck with your search! bananas - to answer your questions - all three barrel lengths were utilized. If you can locate a copy of "Packing Iron" - you'll see that - all depends on the time period, what was available in the models, etc. Personally - I have had 4 3/4", 5 1/2" and 7 1/2". I had a Ruger NV in 5 1/2" .357 - that is now consigned with a gun shop and after I got my Uberti 4 3/4" Bisley in 357, the NV just took up space and collected dust. I like the 4 3/4" barrel for ease of carry anti is plethysmograph accurate - I don't shoot competition so you needs may be different. On my 45 Colt Cattleman, I got the 7 1/2" barrel primarily for the historical aspect of it - I had an ancestor at the Little Big Horn and that was what was issued. I don't regret getting the 7 1/2" as it's a lot of fun to shoot - reaches out there and I've been surprised at what I can hit at 50 yards - and my eyesight is not that good! LOL - I'm used to shooting longer barrel lengths as I have shot BP C & B revolvers for over 50 years - primarily '51 Navies. When I got my '51 Uberti Richards and Mason conversion (38 special), I went with the 7 1/2 barrel - don't regret that either. Barrel length all boils down to "personal choice". On the Bisley model - if you've never handled one - try to. I had always wanted a Bisley but was not going to shell out the $$ for an original one. 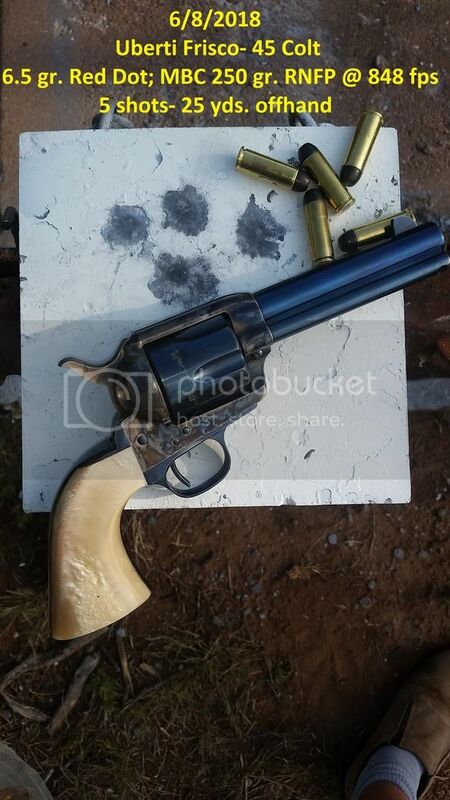 When I got my Uberti 4 3/4" - it took me a while to get used to the Bisley grip - it's different - especially when you are used to shooting the regular old plow handled revolvers. Once i got used to the Bisley grip though - I love it and enjoy shooting it. It's not for everyone though so if you are thinking about one, try to find one you can handle first. I say this because we all have different hand sizes - I would classify mine as probably small to medium size. Someone with hands the size of hams might find the Bisley grip uncomfortable? I'd be interested to hear on that for those that have the Bisley model. Ruger has/had ? a Bisley model - never handled one of theirs. I have two Cattleman revolvers in 44-40 - one with the 7.5" barrel and one with the 4.75" barrel - and both barrels had the same front sights. 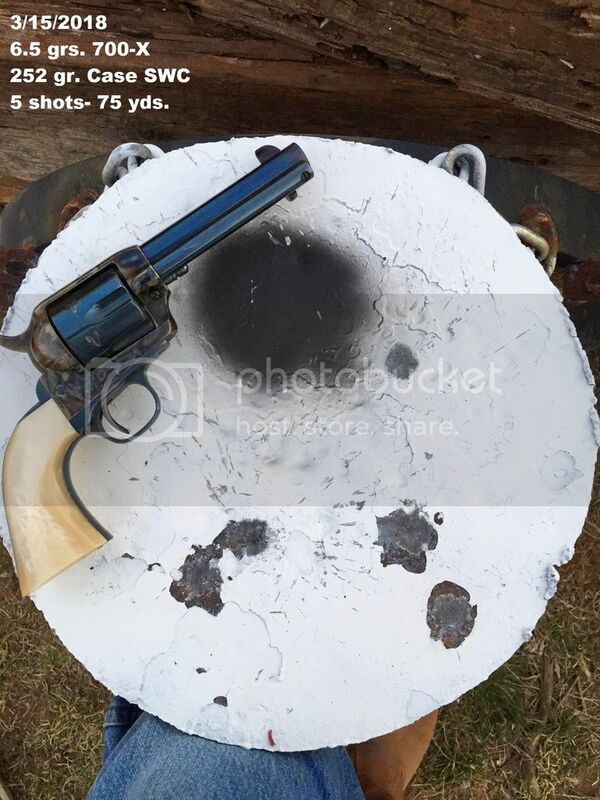 I did have to file the front sight of the short barreled revolver to get it close to hitting the target. I also have the small Lightening in .41 Colt and the Short Rifle in 44-40 and am satisfied with all of them.